Saturday, September 15th, 2018 at the Evergreen Sportsmen's Club located at 12736 Marksman Street SW in Olympia. Sporting clays is a shotgun shooting competition in which clay pigeons are presented to a shooter in ways that mirror the flight pattern of game birds, or occasionally rabbits, in their natural habitats. Sporting clays is exciting and challenging! 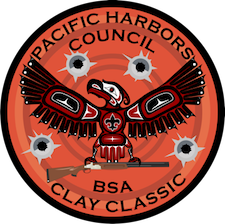 Join us for this new annual tournament to support the Pacific Harbors Council, Boy Scouts of America's Scouting programs. This year, the council will invest over $190 in each of our 8,000-plus Scouts. We prepare young people to be leaders and responsible adults in communities where they live and work. Your company name & logo on signage at a station, event website recognition. You will be contacted for digital versions of your company logo. One squad of six shooters, your company name & logo on signage at a station, event website recognition, full mulligan at your organization's station. You will be contacted for digital versions of your company logo.